Carl Kears and James Paz, eds. Medieval Science Fiction. KCLMS XXIV. London: Centre for Late Antique & Medieval Studies/Boydell & Brewer, 2016. The book begins with James Hannam’s foreword, “Medieval Science and Fiction.” In the foreword, Hannam reviews the problem that we all encounter whenever someone outside the field hears the word “science” in close proximity to “medieval,” and scoffs that “everyone knows there was no science in the Middle Ages” (xv). He provides a quick, useful summary of what we do know about science in the European Middle ages, giving overviews of different cosmologies, the Quadrivium, travel literature, treatises on flora and fauna (including bestiaries), medical texts, and texts on astronomy. Hannam’s foreword on its own could be a wonderful addition to an introductory medieval studies course, as it gives readers a solid catalog of both major pre-modern scientific concepts and authors (e.g., Macrobius, Martianus Cappella, Dante, and Boethius). In the introduction to the volume, “Medieval Science Fiction: An Impossible Fantasy?,” Carl Kears and James Paz build on Hannam’s engagement with the popular belief in the incompatibility of science and the Middle Ages, particularly the idea that “the terms ‘medieval’ and ‘science fiction’ do not belong together” (3), before briefly discussing the disagreements in the field about when, exactly, science fiction seems to have originated. 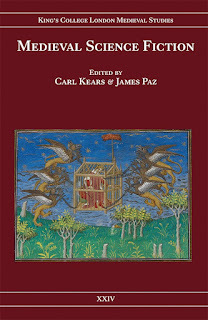 In addition to summarizing the essays contained in the anthology, Kears and Paz focus quite a bit on defining the characteristics of science fiction, considering the ways in which those characteristics do apply quite appropriately to a range of medieval works, and going over the uses acknowledged science fiction makes of medieval settings and characteristics. The first sub-section of the volume, “Science & Fiction in the ‘Dark Ages’,” contains one essay, “Is Beowulf Science Fiction?” by Daniel Anzelark, which establishes the strength of a claim for Beowulf as medieval science fiction by contrasting the way that Bede and Ælfric describe the creation of the earth, highlighting Ælfric’s focus on the spiritual importance, and Bede’s focus on the scientific characteristics. Anzelark’s point is that the Beowulf author’s description of the creation of the earth in lines 90-98 of the poem are much closer to Bede than to Ælfric, an argument that helps to solidly establish the idea that medieval authors, too, drew contrasts between spiritual and scientific understandings of the world around them. “Time & Space Travel” is the second section, and it examines a variety of journeys between temporal settings. In “The Future is a Foreign Country: The Legend of the Seven Sleepers and the Anglo-Saxon Sense of the Past,” R. M. Liuzza provides strong follow-up to Anzelark’s essay on Beowulf, making an argument for seeing the stories of displacing sleep as a variety of time travel that “folds” past and present as neatly and bewilderingly as any time machine. Patricia Clare Ingham shifts to modern science fiction featuring time travel back to the middle ages in “Untimely Travel: Living and Dying in Connie Willis’s Doomsday Book.” Ingham’s essay examines Willis’ use of a historically medieval setting to draw together the past and future, highlighting the similarities of human experience during parallel events in two times that initially seem to have more differences than commonalities. While all three essays in this section were strong, Jeff Massey’s “‘On Second Thought, Let’ Not Go To Camelot . . . ’Tis a Silly Space’: Star Trek and the Inconsequence of SF Medievalism” deals with a sore spot that can be particularly annoying to those who love both the medieval and science fiction. Massey explores the rather obnoxious disdain with which a variety of Star Trek series (mis)treat not only medieval narratives, but even the very concept of medieval culture, exposing a weakness in Gene Rodenberry’s generally strong series. The volume’s third section is titled “The Alien,” and includes one essay that examines medieval aliens in the form of the Green Children of Woolpit, and one that discusses modern aliens with Anglo-Saxon connections. The legend of the Green Children is examined at length in Mary Baine Campbell’s essay “‘Those two green children which Nubrigensis speaks of in his time, that fell from heaven’, or the Origins of Science Fiction”; Campbell makes an admirable effort to sort out the singular and confusing story of the Green Children of Woolpit by looking at the accounts of Ralph of Coggeshall and William of Newbury, as well as their literary inheritors. While Campbell’s argument does not clarify how we should understand the story, she makes a strong point that in both accounts, we can see clear use of scientific information to try and understand the children’s origin and meaning. Campbell’s discussion of terrestrial aliens is followed by “Aliens and Anglo-Saxons in Edwin Morgan’s ‘The First Men on Mercury’” by Denis Ferhatović, which introduces the fascinating language play and linguistic creep that Morgan uses as a theme in a range of his poems. Morgan’s deconstruction and reconstruction of language dramatizes not only the way that languages and people mix and change one another in “alien” encounters, but also the way in which our experience of works from the past change us more than we know or may want them to. The discussion of little green men is followed by a section titled “Technologies & Manmade Marvels,” which begins with Andy Sawyer’s essay “The Riddle of Medieval Technology.” Sawyer opens his essay with the Discworld novels of the greatly missed Terry Pratchett, highlighting one of Pratchett’s main strategies for humor: the juxtaposition of what “everybody knows” with what actually is. Sawyer uses Pratchett as a model, comparing “the medieval worlds depicted in SF with the actuality of so-called non-technological societies,” which leads him to the conclusion, explored through the rest of the essay, that the resulting “disjunct . . . can only be solved by questioning our assumptions about these societies and what ‘technology’ and ‘science’ meant to them” (153). He also asks the question, prompted by the work of historians like Lynn White and Jean Gimpel, of what science fiction might result from regarding “the medieval period as one which creatively and speculatively embraced technology” (153), answering that question with an examination of Terry Pratchett’s depiction of technological advances in the Discworld novels. The second essay of this section, “Dreams of War, Dreams of Dragons’ Fire: Conrad Kyeser’s Bellifortis” by Alison Harthill, discusses military devices and strategies that seem more suited to Pratchett’s fantasy world than to the 15th century audience for whom it was written. Harthill’s analysis of Kyeser’s fantastic manual is a fascinating examination of the way that medieval treatises on warfare could move beyond realistic strategy into a fantastic realm of imagined technologies. Harthill focuses on a range of weapons from the text, including automata, fireworks, and magic, arguing that the text is meant less as a practical handbook—though it can function as such for some elements—and more as a work meant to “provide the reader with material for dreams which go beyond the bounds of what is known, what is reality” (191), helping to create the sort of strong leader of whom Kyeser himself dreamed. The fifth section of the anthology, “Distant Planets, Distant Futures,” contains two essays that make strong cases for the clear continuation of medieval literary traditions in science fiction as a genre. This part of the book begins with “Courtly Love on Mars: E. R. Burroughs and the Medieval Lineage of Planetary Romance” by Andrew Scheil. Edgar Rice Burroughs’ Barsoom series, a science fiction classic, must make its way into any anthology dealing broadly with science fiction; here, Scheil links Burroughs’ series in for the distinct way in which it brings science fiction and courtly love together. Scheil’s main argument is that the Barsoom series needs to have “a place in the study of early twentieth-century medievalism” (201), and also that planetary romance as a genre needs to be considered as a form of neomedieval romance. In “The Medieval Dying Earth,” James Paz switches to an earlier time, pointing out the resurgence of elegy in science fiction. Paz opens his essay by juxtaposing a passage from Jack Vance’s Tales of the Dying Earth (a collection of linked stories) with a passage from the Old English elegy The Wanderer, using the striking similarities to argue for the importance of looking at new apocalyptic fiction in relation to old apocalyptic works. In addition to the texts with which the essay begins, Paz discusses Gene Wolfe’s Book of the New Sun and another Exeter Book elegy, The Ruin, highlighting the way all four works make use of what Kathleen Davis termed “multiple temporalities” (qtd. in Paz 222). The final section of the volume, “Making Medieval Science Fiction,” changes from establishing a space for the medieval elements we see in science fiction to discussing how to actively distinguish, develop, and promote a realistic medieval aesthetic in science fiction. Minsoo Kang begins this last piece of the book with “Catapunk: Toward a Medieval Aesthetic of Science Fiction.” Kang approaches the problem of medieval science fiction from a very different direction than most essays in the anthology. He begins by analyzing how the medieval has been re-envisioned in science fiction, then shifts from what is to what could be, determining what characteristics would need to be present in a truly “medieval science fiction,” coining the term “catapunk” (the catapult being a “quintessentially medieval device” in the way that steam was central to the 19th century in which steampunk is set) as a genre term for works that fit this definition (257). Kang’s definition is followed by Guy Consolmagno’s “Medieval Cosmology and World Building,” which makes an argument that could be very helpful to any author interested in experimenting with “catapunk,” and expands nicely on James Hannam’s foreword with a careful and thoughtful look at the range of cosmologies available to the well-read student of religion and philosophy, both in our time and the Middle Ages. Consolmagno highlights the way that many different cosmologies overlap and interact within individual eras (not only the medieval, but our own as well), pointing out the importance of recognizing how each cosmology has a foundation of assumptions that may not align with other cosmologies. This point is particularly significant when he examines the lack of alignment between our current requirements for high standards of proof as a reason for the difficulty we have understanding pre-Enlightenment cosmologies. The final essay, “Discovering Eifelheim” by Michael F. Flynn, fits well into the “Making Medieval Science Fiction” section, but is also quite different from the rest of the essays in the book. It is a discussion of process by Flynn, a writer of what we can, by this point in the anthology, term “medieval science fiction.” It’s a nice inclusion to have in an anthology mostly focused on scholarly analysis, and adds a perspective on the issue that is different but no less thought-provoking and rigorous than the essays by scholars of literature and history. Overall, this volume should be a welcome addition to any library frequented by scholars of medieval studies or science fiction; the essays included all rise admirably to the challenge of creating a space in which the concept of medieval science fiction not only makes sense, but also helps us to consider old and new texts from different angles. The choice to bring in scientific, historic, and philosophical texts as well as literary works is a strength of this anthology, giving it a breadth that is sometimes lacking in academic anthologies even in a diverse field like medieval studies. 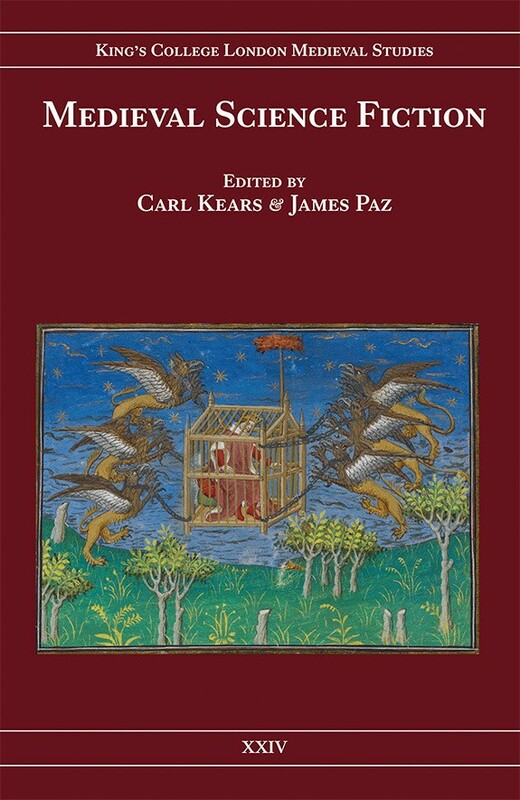 Paz and Kears have put together an excellent, interdisciplinary volume that emphasizes the wide range of approaches we can take as the study of medievalism continues to develop.